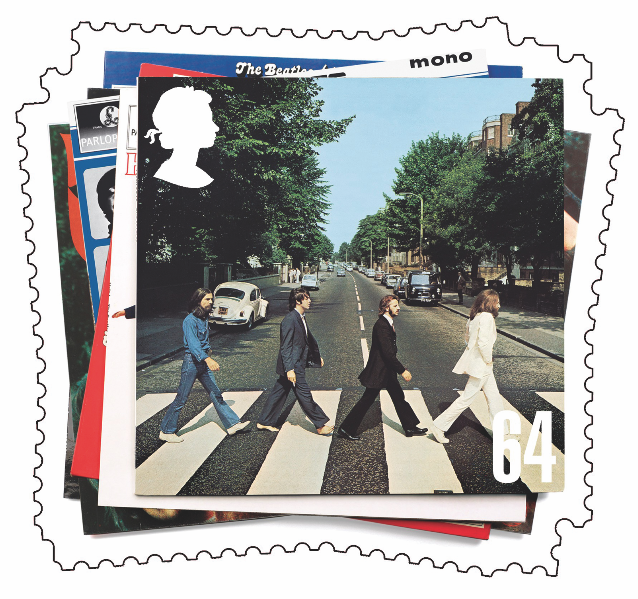 This hugely popular 2007 stamp set from Royal Mail consists of a set of six stamps and a miniature sheet with a se-tenant block of four first class stamps. 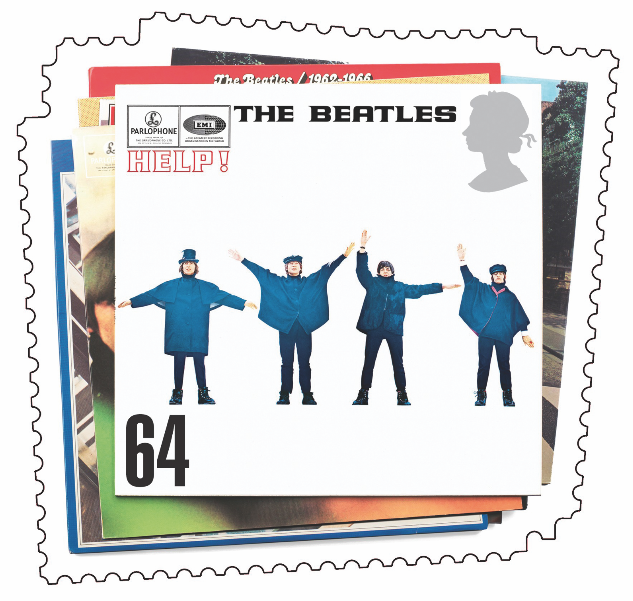 The stamps are free-form in shape giving the impression of a carelessly piled stack of albums, with tantalising glimpses of other sleeves underneath. 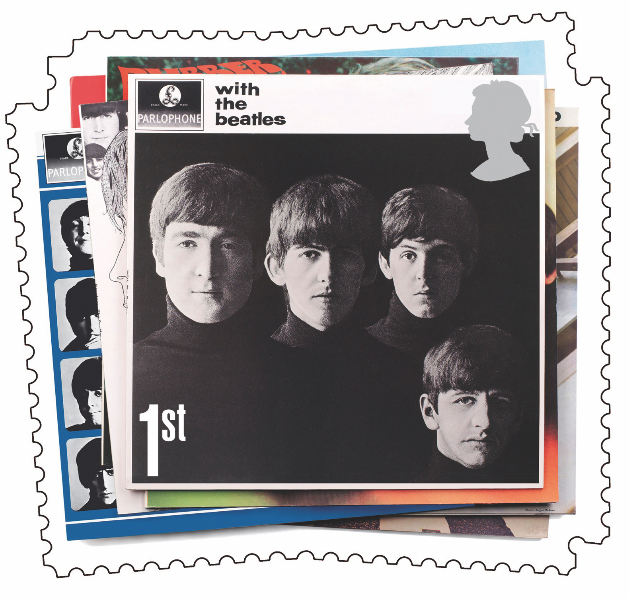 The Queen’s silhouette is perched uncertainly in one corner, in white on four of the stamps, though it would have been more visible on the Revolver stamp had it been rendered in black. The set commemorated the 50th anniversary of the first encounter between John Lennon and Paul McCartney. The meeting of John and Paul has been compared to the historic encounter of David Livingstone and HM Stanley, or even that between Jesus and Peter the fisherman. If that sounds exaggerated, who could have imagined the extraordinary impact of Lennon and McCartney on the music of the 20th century, let alone the enormous influence of the Beatles on succeeding generations of young people all over the world. It’s hard to over-estimate the importance of the Beatles in leading the British invasion of American youth culture in the 1960s. 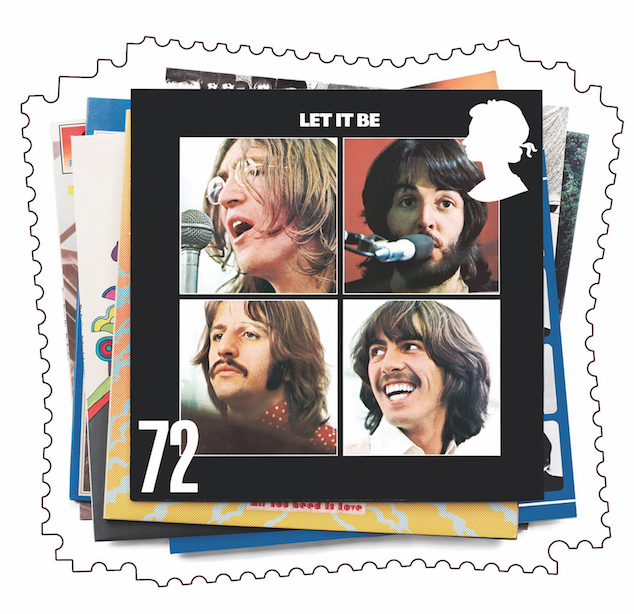 Their multi-layered approach took pop music to undreamed off heights, but the influence of the Beatles extended far beyond their music. Their attire, hairstyles and oft-quoted remarks made them the trend-setters of the Sixties. 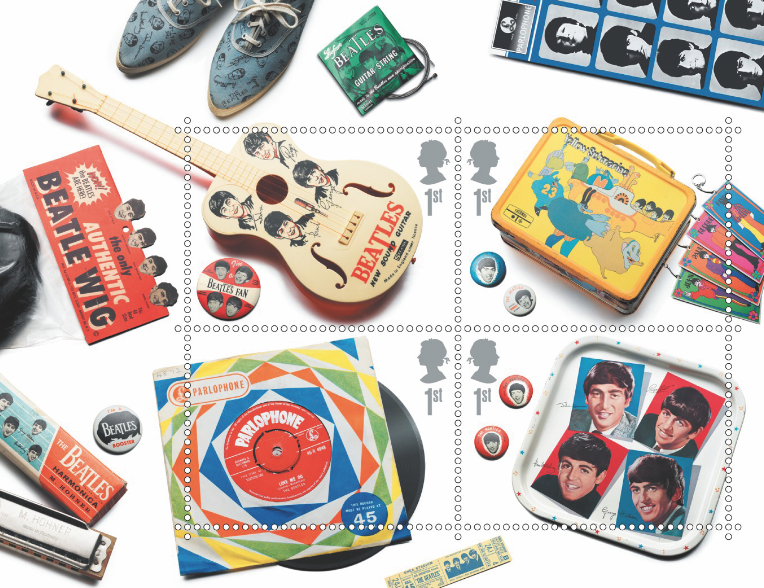 The miniature sheet depicts an odd assortment of memorabilia, a toy guitar, a lunch-box, a tin tray and an extended play record, with further bits and pieces in the sheet margins, such as a Beatles wig, sneakers and mouth organ. These objects reflect the spin-offs from the discs at a time when merchandise (beyond the world of Disney) was little exploited. 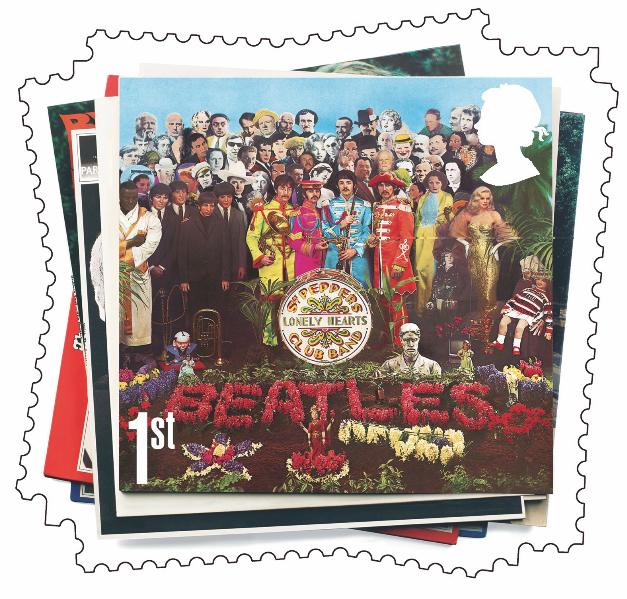 Even the first day cover is decorated with record sleeves and the lid of a Beatles jigsaw puzzle, while the back of the cover reproduces the backs of the album sleeves featured on the stamps. 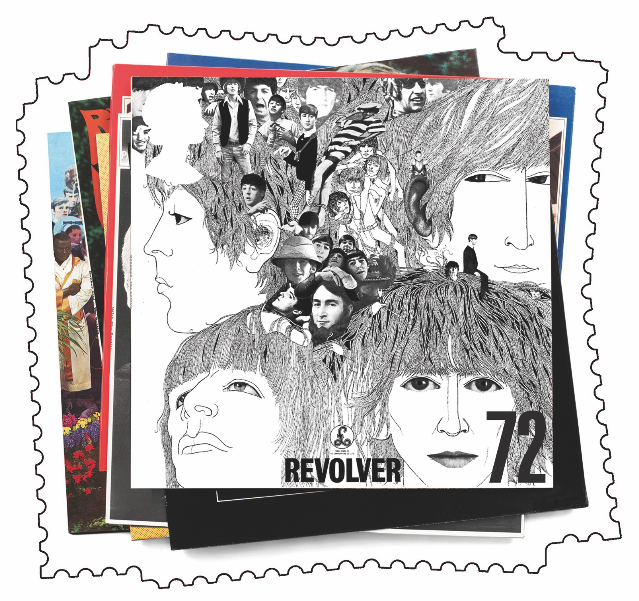 The Tallents House FDC cancellation shows two guitars while the alternative handstamp from Liverpool depicts a drum kit and a guitar.